A toddler bed is a small, low-to-the-ground sleeping surface for tots who are transitioning from a crib to a bed. It features the same crib mattress but is a smaller version of a regular single bed. Typically, it will come with side rails and is low to the ground to help prevent tots from falling or rolling out of bed. It’s also not that dramatically different from a crib, helping them to move on to a regular-sized bed once they reach school age. The market is full of different toddler beds – some standard, others themed in your tot’s favorite cartoon characters. Take a look around the internet, think about what you want, then choose a toddler bed that’s going to be safe and sound for your tot as they transition to a regular bed. There are plenty of fantastic options and advice below. Even though the assembly process of this toddler bed will get blood pressures rising due to terrible instructions and mismatched holes, it’s still an excellent option for any parent. Once you assemble it and place it in either your boy or girl’s bedroom, you will see that the frustration was worth it. The contemporary design looks the part in any bedroom, while the vast color options will ensure you won’t have any trouble matching one to your other furniture. Select from cherry, natural, white, gray, and espresso. Along with the bed, which includes a pine wood frame and side safety rails, you also receive a headboard. As a result, the entire bed is framed together to be safer for your toddler than a regular bed. The side safety rails are also for both sides of the bed, meaning you don’t always have to have the toddler bed against the wall. The price is another standout feature, as is the weight capacity. Even though it doesn’t cost a lot, it can still hold a child weighing up to 65 pounds. The recommended weight range is from 35 pounds onwards. This toddler bed will frustrate you in the beginning, but once you see your child sleeping in it, you will be glad you decided to buy it. If you struggle to get your toddler to sleep in their bed, then it might be time to buy them this toddler bed from Costzon. Once they see the bright, vibrant colors and the lions printed on it, they will be more likely to run toward their bed instead of yours! This toddler bed is bright, colorful, well made, and features robust P2-grade MDF materials. Even though it’s not solid wood, it still has a generous weight capacity of 132 pounds, being more than suitable for children between three and six years old. The safety features of this toddler bed will also have you adding it to your shopping cart. Not only is it low to the ground so your child can get in and out effortlessly, but it has guard rails as well. These can help to stop them from rolling out of bed in the middle of the night. Even though you may need to sand off sharp, unfinished pieces of wood on the rail, the price tag coupled with the style will see this bed jump to the top of your must-have list. 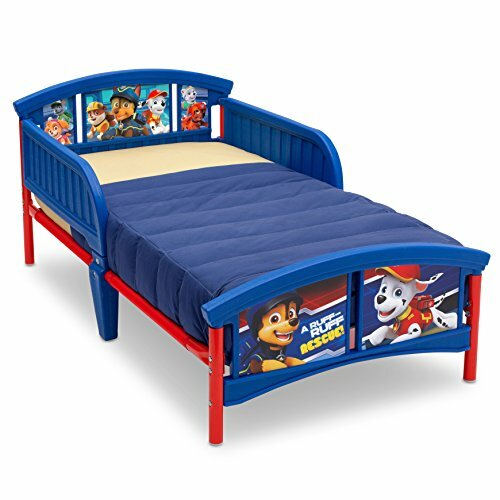 If your child is a massive fan of Paw Patrol, then don’t look past this toddler bed when you’re trying to transition them out of their crib. 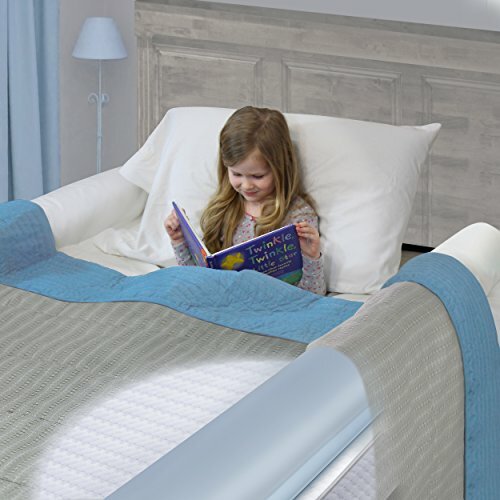 While you can use your cot mattress in it instead of having to buy a new one, you’re able to get your child into a “big person’s” bed with minimal hassle. Once they see the dog stickers on the red and blue plastic frame, they will fall in love. 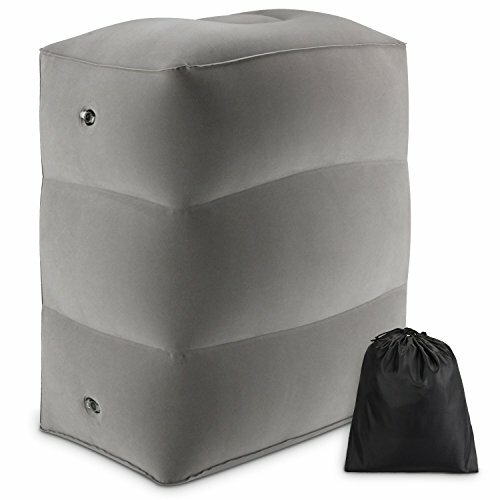 The plastic components are easy-care and encompass the bed with guard rails for a safe night’s sleep. All parts are also JPMA certified to be as safe as possible for your children. The frame itself, however, is steel and has a 50-pound weight capacity to suit children aged 15 months and older. Not only is it a funky bed your child will adore, but it’s an affordable one too. Buying a toddler bed should not be a significant investment, and this one meets the mark. The only thing to consider is whether your child jumps on the bed. It does not have a high weight capacity and could break under the weight of jumping children. If you consider yourself to be a DIY expert, then there’s every reason to consider purchasing this toddler bed from Dream on Me. If you aren’t that handy with the tools, then you may like to get someone to help you. Once you assemble this bed, you will love everything it has to offer, but getting to that point can be a challenge. The instructions are poor-quality and sometimes, not all the parts come with it. What’s more, if you want to convert it to a table and chairs, you have to buy a conversion kit. These points aside, there is still much to adore about this toddler bed. It’s available in 15 beautiful color options, so you will have no trouble finding one to suit your child’s room décor. It also comes with guard rails to protect them from falling out, as well as being low to the ground if they somehow end up being able to. It’s also safe for children weighing up to 50 pounds and uses New Zealand pine wood in the construction process to be as safe and sound as possible. 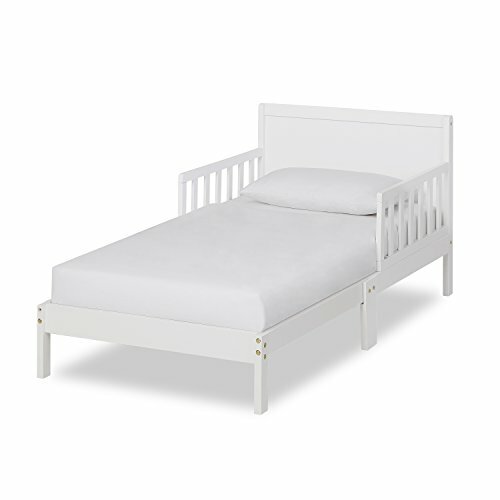 If you have a mattress from your child’s crib, then you can use it in this bed, or you can also buy one to go with it. In either instance, the entire purchasing process won’t break the bank. This bed isn’t perfect by any means, but it’s still an affordable, standout option in the toddler bed market. If you don’t mind setting aside an hour or so to go through the frustration of assembly, then there’s every reason to consider purchasing this toddler bed from Delta Children. Not everyone finds putting it together that difficult, but if you end up with one where the drill holes don’t line up, then it’s not going to be easy. However, once it’s up, it won’t give you any more problems. You will enjoy the Bianca white, gray, or dark chocolate finish in wood, as well as the contemporary styling. You may even relish in the opportunity to purchase additional Delta Children furniture to match the 50-pound capacity bed. The compact size of this toddler bed is also a standout point, as it’s ideal for children 15 months and older but won’t take up much room in their bedroom. If you’re worried about safety, you then get to enjoy peace of mind that it has both side rails and JPMA certification. This easy care, sleek, and stylish toddler bed is well worth your consideration, and you can either use your crib mattress or buy a new one with the bed. If you want your toddler bed to be as stylish as your own, and their bedroom contemporary too, then you might like to take a close look at this bed from Dream on Me. If you don’t have a lot of patience or skills with furniture assembly, then it’s not the bed for you, but if you don’t mind spending a few hours with terrible instructions, then nothing is stopping you. This cute toddler bed comes in 11 colors to suit any bedroom décor you have, and all color options come with safety guard rails. These rails coupled with the low style of the bed ensure your toddler is as safe as can be. What’s more, it’s ideal for any child up to 50 pounds in weight and has wood construction so you can rest assured it’s going to last the distance. Even though the assembly process can leave a sour taste in your mouth, the style of this toddler bed coupled with the color options, safety, and beautiful styling will see you happy with it at the end. If you go on camping trips a lot, or you need a portable bed to leave at grandma’s for visits, then this is the very toddler bed for the job. Instead of buying a permanent one that takes hours to set up and takes up a lot of room, you can buy this portable and foldable version instead. 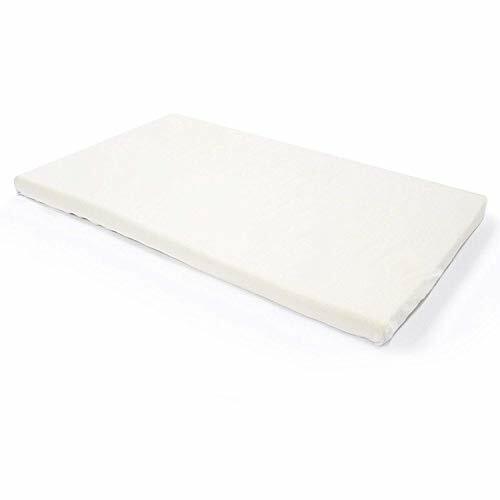 This toddler bed has robust foam that cocoons a child within it on a 48 x 20-inch mattress. You can then fold it up, velcro it shut, and carry it with the attached handles. This bed has everything going for it. The interior is waterproof velour that’s effortless to wash, while it also comes with a machine-washable cover and fitted sheet. The only downside of this setup is that when you remove the cover, the zips are terrible quality and may break. For the energetic sleeper, this toddler bed may not meet the mark as it doesn’t hold its shape well, but it’s a comfortable bed for camping and sleepovers nonetheless. It costs a bit of money but can you put a price on convenience? 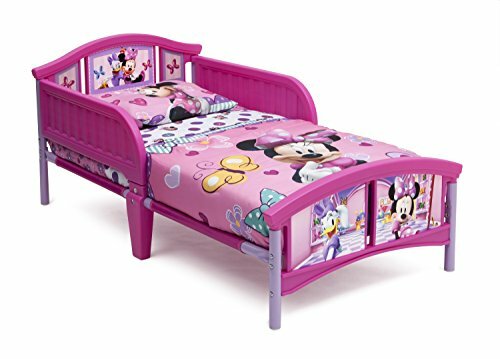 If your toddler is Disney Pixar mad, then you won’t be able to stop yourself from buying this Disney toddler bed to grow that passion. With nine Disney themes that are suitable for all toddlers, you are going to put a smile on your toddler’s face for a long time. What’s more, there are so many things to love about this bed. Firstly, it has a 3D footboard which is bound to be a favorite with the kids. It’s also vibrant plastic which is easy to care for and keep clean, as well as having a robust steel frame underneath. Even with the steel frame, however, it’s still only suitable for a 50-pound child over the age of 15 months. 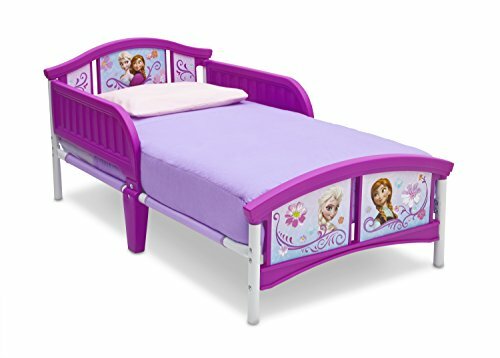 You can use this bed with your crib mattress, and it also comes with side rails too. These rails coupled with the low legs mean your toddler is less likely to fall out than with a regular bed. It’s affordable, looks cool in any kid’s bedroom, and even though it’s a challenge to assemble, will be one of the best purchases you’ve made for your toddler. A toddler bed doesn’t have to be a tacky-looking bed with a lot of colors and funky style touches. Instead, it can be elegant, reminiscent of days past, and stylish to tie in with your home furniture. That’s what’s on offer from Little Seeds. This beautiful toddler bed offers all manner of stylish touches to see you want to add it to your child’s bedroom in no time. You can buy it in gray, gold, bronze, white, and pink to suit your furniture, and then enjoy the 18th-century wrought-iron look that goes with it. It also features non-toxic steel tubing, ball castings, arched metal, and curved corners. Everything about this toddler bed says elegance. What you will also appreciate is that, unlike other toddler beds, it’s not hard to assemble. It takes a little bit of time and not a lot of effort, and then it’s up and ready for use. It’s also robust, reliable and, even though it squeaks, will be a well-loved bed by your tot. The product photo is deceiving as it doesn’t show the screws, and the labels are hard to get off, but these are two minor points in the grand scheme of things. Overall, if you were to match this toddler bed with exquisite Little Seeds furniture, you will have a bedroom that looks akin to those in a home and garden magazine. As any parent will know, purchasing anything for your toddler is a long, drawn-out process. After all, you don’t want to give them anything that could potentially be unsafe. That’s why when the time comes to transition your tot from a crib to a bed, you want to take as much time as you need to choose the right one. Fortunately, there is no shortage of toddler beds on the market – in all different shapes, styles, and sizes. All you need to do now is consider these points below then buy one that ticks all the boxes. When you are on the hunt for a new toddler bed, the size is important. Not all children are the same size, so pay attention to the bed dimensions. How long will it last them? Will it be big enough for them now, or too big? 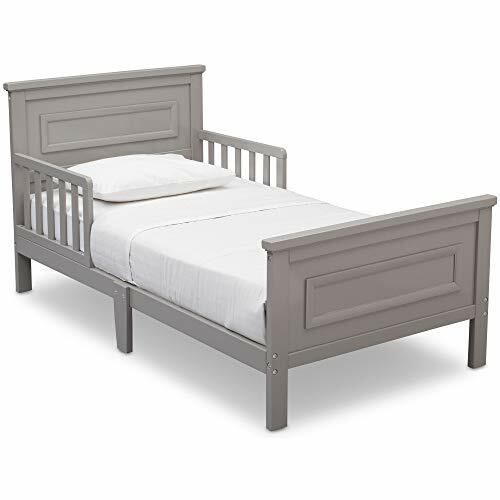 The manufacturer always supplies the sizes so compare these to their current crib and see whether the bed you are looking at will meet the mark. A toddler bed usually is suitable for tots between the age of 15 months and five years old, but that can differ depending on your child’s independence and size. It might not be a significant factor in the decision-making process, but it can still matter. Is your child lighter than others, or heavier? The weight capacity can differ from one bed to the next but tends to be around the 50-pound mark. There are a few beds on the market that are over 100 pounds, so consider which could be the better (and safer) option for your child – especially if they jump on the bed or are active sleepers. The three most commonly used materials in the construction of toddler beds are steel, plastic, and wood. Some have top plastic components such as head and footboards and guardrails along with steel frames. Others are entirely wood – such as pine.